"The greatest threat to mankind, is mankind"
For Dwi Astuti of Beku and Wiji of Jeblog, both are difable friends from Karanganom Sub-district, Klaten, they never thought that they will join the SHG, along with the community in their villages. Joko Waluyo of Pomah Village, Tulung Sub-district, a difable person, becomes the Chairman of SHG in Pomah Village, which consisting of 20 members. Sanggar Anak Inklusi (Inclusive Children Studio) Nguter village, Nguter sub-district, Sukoharjo district was trusted by the local government to held Community Based Rehabilitation (CBR) activities. Even, the officer cooperative of Nguter sub-district provided the place to held CBR planning program implementations. 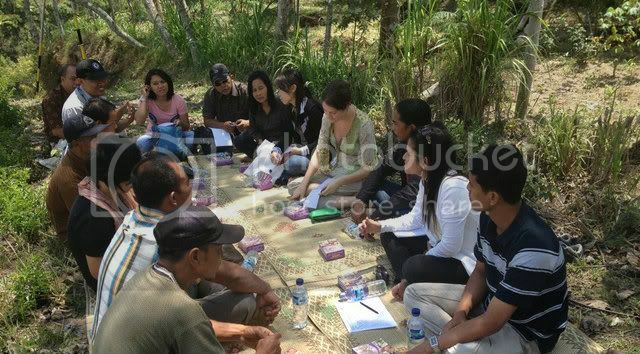 Saturday, October 27, 2012, Catholic Aid Agency for England and Wales (CAFOD) visited the communities which are assisted by KARINAKAS in the slope of Merapi mountain in Tegalrejo village, Kemalang sub-district, Klaten district. Along with KARINAKAS staff, CAFOD had dialogue in 6 km from the Merapi summit. On Sunday, October 21 & 28, 2012, children of reading group member from 3 assisted villages of CBR KARINAKAS Bantul held an outbound in Kampung Dolanan, Pojok Budaya, Sewon, Bantul. On the first day, the activity was attended by 31 children including 7 children with disabilities (Down-Syndrome, Blind, SCI, and MR) from Plebengan, Sidomulyo village and Kralas, Canden village. 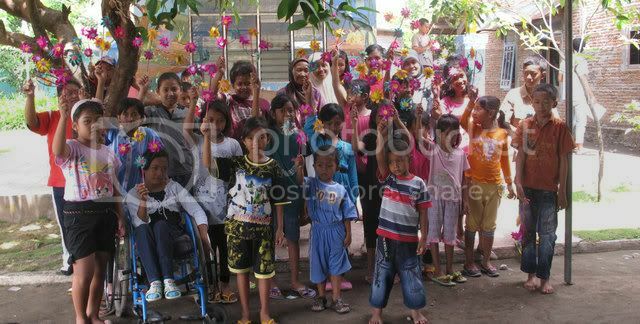 On the second day, the activity was also attended by 31 children including 7 children with disabilities (Down-Syndrome, CP, SCI, MR and Hearing Impairment) from Gaten and Srayu, Canden village as well as Jamprit, Panjangrejo village. “Hopefully, this reading group outbound could give opportunities for children with disabilities (CWDs) and other children to play and do activity together,” said Margaretha Widiastutik, the staff of Education sector in CBR KARINAKAS Bantul.